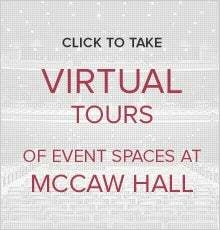 Below is a historical overview, from 1881 to the present, of McCaw Hall. 1881: Saloon owner James Osborne donates part of his estate to the City of Seattle for a “Civic Auditorium.” At the time, the amount equaled the entire budget of the City of Seattle. 1927: Seattle citizens pass a $900,000 bond issue to complement the money from the James Osborne estate and the Denny gift of land in order to build the Civic Auditorium. May 18, 1928: The new Civic Auditorium is dedicated, in part, by Seattle’s only female Mayor, Bertha K. Landes. The Civic Center also includes Ice Arena (now Mercer Arts Arena) and Civic Field (now Memorial Stadium). 1930’s: Patrons begin attending symphony concerts. 1940’s: San Francisco Opera, Marian Anderson, Danny Kaye, Arthur Rubinstein and many others make local appearances in the Auditorium. 1956: Civic Center bond issue is proposed to upgrade the Civic Auditorium into a performance space for the 1962 World’s Fair. The bond passes and the Civic Auditorium receives $2.75 million for improvements to the exterior and public areas. No improvements are made to the mechanical, technical and backstage areas. 1959: Construction begins to transform the aging Civic Auditorium into a 3,100-seat Opera House in preparation for the 1962 Seattle World’s Fair. April 21, 1962: Seattle Center Opera House Grand Opening. Van Cliburn performs Rachimanioff’s Piano Concerto No. 3.; Igor Stravinsky conducts the Seattle Symphony in performing his Firebird Suite. 1964: Seattle Opera opens its first season with Tosca. 1973: Pacific Northwest Ballet opens its first season in the Opera House. 1980: Bumbershoot Festival appears in the Opera House. 1990: The Seattle International Children’s Festival makes its Opera House debut. 1998: The 17th annual Northwest Folklife Festival presents a special Women’s Concert at the Opera House featuring women drummers, precision cloggers, storytellers, and musicians. June 30, 1998: Seattle Symphony performs final concert at the Opera House. 1999: Eight hundred Seattle middle and high school students explore their hopes and dreams for racial harmony and cultural richness at the Youth Forums on Race. November 2, 1999: Seattle citizens pass Proposition One, dedicating $29 million to the transformation of the 73-year old performance hall. December 27, 2001: Pacific Northwest Ballet’s Nutcracker is the final performance in the Opera House. January 17, 2002: Groundbreaking for Marion Oliver McCaw Hall, marks the beginning of the third and most dramatic transformation of the auditorium. 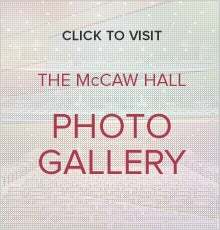 June 28 – 29, 2003: Grand Opening of Marion Oliver McCaw Hall. August 2, 2003: Seattle Opera’s opening night of their Inaugural Production, Parsifal. September 25, 2003: Pacific Northwest Ballet’s opening night of their Inaugural Production, The New Swan Lake. September 29, 2003: Inaugural concert with Olivia Newton-John. December 22, 2003: The 250,000th visitor passed through the hall during PNB’s Nutcracker. August 2005: Seattle Opera’s opening of Richard Wagner’s Ring des Nibelungen at McCaw Hall. December 2, 2005: The 1 millionth visitor passed through the hall during PNB’s Nutcracker. December 2006: 1,000th event is held at McCaw Hall. February 9, 2007: The Seattle International Film Festival Group (SIFF) opens its year-round programming venue, SIFF Cinema, in our Nesholm Family Lecture Hall. Crossing Borders is the first film shown. June 28, 2008: At our 5th year anniversary-mark, over 2 million guests have walked through our doors and 2,539 events have been held. 2011: SIFF announces that it is re-opening the Uptown Theater in Queen Anne as a new venue for SIFF Cinema and will close its inaugural SIFF Cinema venue in the Nesholm Family Lecture Hall. October 16, 2011: SIFF’s last screening, El ambulante, is held in the Nesholm Family Lecture Hall.